Compact? Yes. Affordable? Indeed. Powerful? Absolutely! 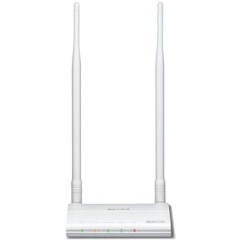 The AirStation Wireless-N router WCR-HP-G300 features incredibly powerful detachable 8 dBi antennas for speedy data transfers without stalls or glitches, even with smartphones and tablet devices! Enjoy reliable, high-speed streaming of HD movies and video, music, and other multimedia content, thrill to quicker gaming action, download photos, e-mail, and more at transfer rates up 300Mbps. The web-based setup wizard makes setup very simple and quick. The unit supports AOSS for Android, for one-touch Wi-Fi connections to your Android smartphones. With multiple security and energy-saving options and more, the WCR-HP-G300 is the high-power, functional solution for homes.